In Australia, Tennessee Whiskey is synonymous with Jack Daniels. While there are certainly worse things to drink than Jack, only trying Jack is like judging Australian beer by tasting XXXX Gold (I was going to say Fosters but Americans do actually drink Jack). While we did visit the Disneyland that is the Jack Daniels distillery, we explored a bit further and discovered that Tennessee Whiskey can actually be a pretty great drink! To be a Tennessee Whiskey you need to do everything you need to do be a Bourbon, plus be located in Tennessee and filter your product through Maple Charcoal (aka the ‘Lincoln County Process’). I think we’d break a bunch of Kentuckians’ hearts if we pointed out that not all Bourbon is Tennessee Whiskey but all Tennessee Whiskey is Bourbon! The Lincoln County Process makes peat-smoking look almost environmentally friendly. They cut down a bunch of maple trees, set the lot on fire, and then cool it off with hoses until you’re left with about a bucket or two full of charcoal. They then do this enough times over to fill 10ft deep vats which are then used to filter the distillate before it goes into the barrels. While disastrous for the environment, depending on how you do it, the process can either impart a really interesting smoky flavour to your product or clean your spirit until it tastes not much different to vodka. Jack does the latter but a few other distilleries we visited do the former and the result is pretty freakin great. We were introduced to George Dickel by some Airbnb hosts that we introduced to Vegemite (they liked it so much that they’ve even hunted down a jar of their own! ), and after sampling we were really keen to visit the source. Like a bunch of the bigger bourbon brands, Dickel is made in the same spot in the same way that it has been since it was invented (which for most was way before prohibition). 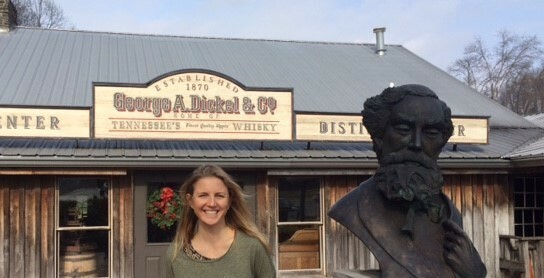 The employees at Dickel were especially into preserving how it was always done and hence waking through their production facility was like walking through a computer- and automation-free time capsule. They must be on to something right though because their Tennessee Whiskey is an excellent whiskey! Dickel are currently testing their first international market- Australia! So if you’re in Australia go buy yourself a bottle or two!